- These are fine metallic bangles/bracelets. These are embedded with beautiful sequins, beads and diamantes. 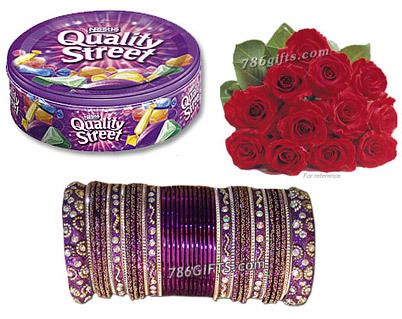 - Nestle Quality Street is an assortment of milk and dark chocolates with hard and soft toffees, soft fruit centers, pralines, and nuts-all in a single box-offer something for everyone. Weight: 450gm. - This arrangement consists of 12 fresh and long-stemmed red roses. A great way to express your love and feelings for someone.